The real value of mistake-making is turning toward the future with less baggage. The future is built by both endings and beginnings. Wisdom gained from mistakes is about endings. It’s useful only as it makes space to try new things. The danger of mistake-making is giving up. #1. Fear of making mistakes is a little dog with a big bark. Most mistakes aren’t as bad as we fear. In some cases, it feels good to get them out of the way. Discuss the worse that could happen with your team. The real issue with mistakes is repeating them. #2. Most people aren’t as comfortable with ambiguity as I am. I’m OK to let things play out and see what happens. Some interpret this as lack of concern. For me, it’s an adventure. Reconnect with purpose and vision, but pull everyone back to the present. #3. Silence, when things aren’t going well, almost always makes things worse. Burying your head in the sand is a good way to get blindsided by a train. #4. Turn the lights to bright when dimming them feels safer. Sometimes the leader’s role is stating the unspoken obvious. Healthy intervention is more about giving people permission to address awkward issues than it is fixing them. Where do the lights need to be turned up? #5. There is a downside to helping. Quick interventions often result in resistance, dependency, or lack of initiative. Give people space to work through their own issues. What has mistake-making taught you? What has mistake-making taught you? Don’t do it again! Some of the key factors for me are there serious outcomes when we make mistakes, loss of revenue, possible bodily injury or loss of life if you work in a dangerous field, customers loose trust, along with disappointment in yourself as well as others. What I have learned is pay attention to details, repeat with the customer what they want, ensure your capable to deliver in a timely fashion, try not to sugar coat everything! Speak when spoken too, offer ideas if the client asks, share similar experiences to ensure ones capabilities. Learn to trust others and delegate. Thanks Tim. I’m taking “repeat what the customer wants” to heart. Really helpful for me. Sometimes I just know too much. S A V E S L I V E S . . .
That despite all the rhetoric, acceptance of failure is grudging, second chances are given unwillingly and that nobody will ever forget your mistakes. Edison found 10,000 ways it wouldn’t work? Nowadays, he’d be out on his ear after about five. Thanks Mitch. Sadly, there’s a lot of truth in your comment. Even as an individual we can really beat ourselves up over mistakes. Generally, people are much more accepting of my mistake when it is the result of effort. In turn I must also do the same. Unfortunately, I see Mitch’s concern as well. That seems rooted in pride and self esteem. That can and will be harmful when it is embraced and acted upon. Prov 16:18…Pride goes before destruction and a haughty spirit before the fall. Thanks Will. The worst mistakes are the ones that happen because we don’t try. It drives me crazy when I hear things like… “I was waiting”… “I didn’t do anything”..
Age and life experience help us to understand ‘making mistakes’ is kinda nesassary if we ever expect to grow. I ‘HATE’ making mistakes, especially publicly. Mistakes teach us what not to do. Best wishes with the interview! I’m a nurse leading a team of nurses – our role involves giving injections to adults and children, sometimes in situations of major life transition – stress upon stress for our patients. I’m working hard to set the ethos that we endeavor always to avoid mistakes (first do no harm). If we do, we need to be open to each other as a team to evaluate how and why the mistake happened, own the mistake in a professional manner, do everything in our control to correct the mistake, and work as a team to improve processes so none of us make that same mistake again. I’m also (gulp) trying to set an atmosphere where my team knows “I may make a mistake, too, so I need your accountability to ensure my professional nursing practices are the same standard that I set for you.” Opening myself up to this level of accountability with those I lead feels oh so risky. However, I’ve worked under supervisors who didn’t mind correcting my mistakes, but expected me to turn a blind eye to their own. Your description of fear as a little dog with a big bark is spot on. Thank you for reminding us of the freedom we can have moving forward with less baggage, simply by handling mistakes (our own and those of others) correctly. Thanks Shelley. I feel the candor and authenticity in your comment and I really respect it. It’s so great to read how you are striving to model the behavior you expect from others. 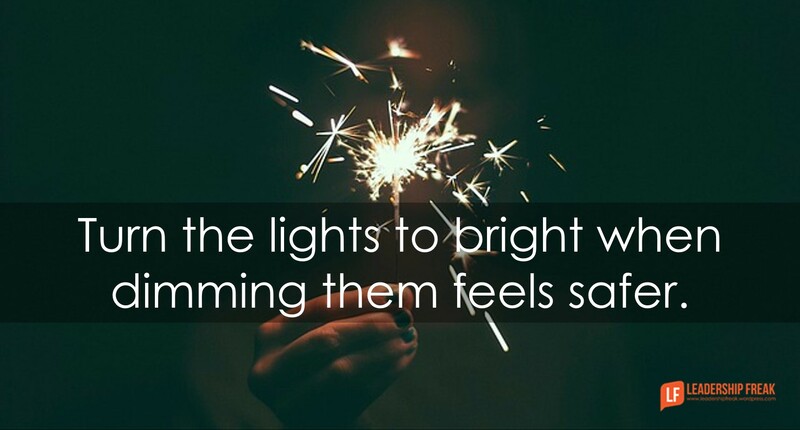 Love turn the lights to bright quote. I am talking with my business students in class about honor and integrity tomorrow, I will definitely refer to your quote. Sometimes the temptation to dim the lights leads to all kinds of trouble in the business world. Thanks Alla. I hadn’t thought about the macro business landscape…but when it comes to mind, you see how dimming the lights is a disaster. By far #3 speaks volume. Thank you for this post, Dan. Mistake-making taught me that fear and (the concept of) safety at work are illusions. And that knowledge freed me from holding my tongue where I see things are going wrong as soon as possible. I’ve found that if I hold my tongue and let things go on — even though I know they are wrong, those things will eventually come back to bite me anyway. So I might as well step out of my comfort zone, speak truth to what it “seems to me” that I see, and if I make a mistake, I live with it.No more #3 for me. And I tell this to every single one of my folks, “Talk. Early and often. Say what you see and let’s talk about it.” Our version of turning the lights on. It’s encouraging to read comments on this post. Dan, I needed to hear each of these points. 1. Little dog-big bark: that description helps. 2. I am really NOT OK with ambiguity – and I am continuously working on that. Thanks to you, I now keep repeating to myself… “take the first step” and “imperfect progress”. 3&4. Problems (or errors) never improve with age. As soon as they are noticed, they should be addressed – even (or especially) by the person that caused them. While this can be a hard pill to swallow, it always works out for the best in the long run. 5. I know this to be true, but if you did this to me, I would probably dislike you for it! (Until I later realized you were truly helping, by developing me). Mistake- making has taught me that while there are those who will never let you forget you make an error, most people truly want to see others succeed, and will forgive errors made with right intent. Thanks Joel. Hats off to you for your transparency. In regard to #5….navigating helpfulness is an important skill. As you indicate, it might cause frustration if you don’t quickly help. Your awareness that development is worth some short-term frustration is helpful. The challenge of being helpful is a little more complex than we might think. Hi all,This information is so timely for me.I am wrestling with changing duties and expectations at my job. The director although he tries to be helpful his comments about my work product is done in front of my peers. I am a supervisor that praises in public and offers constructive criticism in private. It is very frustrating for me to work with .him I used to love to go to work now I wonder if i can do anything right . I am really looking at putting into play #1 and 2 .